(Nanowerk News) In subway stations around London, the warning to “Mind the Gap” helps commuters keep from stepping into empty space as they leave the train. When it comes to engineering single-layer atomic structures, minding the gap will help researchers create artificial electronic materials one atomic layer at a time. The gap is a miniscule vacuum that can only be seen under a high-power transmission electron microscope. The gap, researchers in Penn State’s Center for 2-Dimensional and Layered Materials (2DLM) believe, is an energy barrier that keeps electrons from easily crossing from one layer of material to the next. For the first time, the Penn State researchers grew a single atomic layer of tungsten diselenide on a one- atom-thick substrate of graphene with pristine interfaces between the two layers. 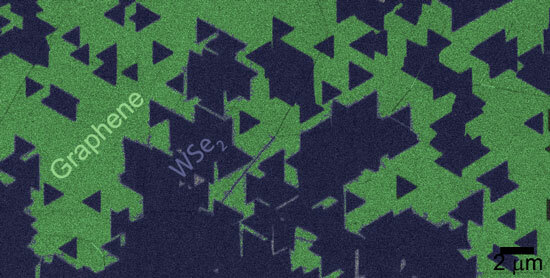 When they tried to put a voltage from the top tungsten diselenide (WSe2) layer down to the graphene layer, they encountered a surprising amount of resistance. About half of the resistance was caused by the gap, which introduced a large barrier, about 1 electron volt (1eV), to the electrons trying to move between layers. This energy barrier could prove useful in designing next generation electronic devices, such as vertical tunneling field effect transistors, Robinson said. The interest in these van der Waals materials arose with the discovery of methods to make single layer graphite by using Scotch tape to mechanically cleave a one-atom-thick layer of carbon called graphene from bulk graphite. The van der Waals force that binds layers of graphite together is weak enough to allow stripping of the single atomic layer. The Penn State researchers use a different, more scalable method, called chemical vapor deposition, to deposit a single layer of crystalline WSe2 on top of a few layers of epitaxial graphene that is grown from silicon carbide. Although graphene research exploded in the last decade, there are many van der Waal solids that can be combined to create entirely new artificial materials with unimaginable properties. In a paper published online this month in Nano Letters ("Atomically Thin Heterostructures Based on Single-Layer Tungsten Diselenide and Graphene"), the Penn State team and colleagues from UT Dallas, the Naval Research Laboratory, Sandia National Lab, and labs in Taiwan and Saudi Arabia, discovered that the tungsten diselenide layer grew in perfectly aligned triangular islands 1-3 microns in size that slowly coalesced into a single crystal up to 1 centimeter square. Robinson believes it will be possible to grow these crystals to industrially useful wafer-scale sizes, although will require a larger furnace than he currently has in his lab.